I belong to a number of private Facebook groups populated by Mormons and Christians. One Mormon apologist asked the group members a good question. He asked, “How did you come to hold the religious worldview that you presently occupy?” The instant thought in my mind was, “I worked for it.” I was immediately struck by the irony of my answer, especially when you take into consideration that it was a Mormon who asked the question. There is a dichotomy of belief between Mormon and Christian thought and this question, and my answer, exposed exactly how different we are and to what depths that difference extends. What I meant by my answer is that I have put a great deal of time and energy into studying, not only what I believe, but why I believe it. I believe it because I worked hard for it. I worked hard to understand it. The Bible is replete with admonition to early Christians to, “test yourselves to see if you are in the faith” (1 Corinthians 13:5), “do not believe every spirit, but test the spirits to see whether they are from God” (1 John 4:1), “examine the scriptures daily to see whether these things were so” (Acts 17:11), “examine everything carefully; hold fast to that which is good” (1 Thessalonians 5:21). The outcome of such study is described in Hebrews 11:1, “Now faith is the reality of what is hoped for, the proof of what is not seen.” In other words, the Christian faith is a reality and there is proof for it, sound reasons to believe it. What is true about Christianity, and what I have proved to myself about it, is that we do not, nor can we ever, reconcile ourselves to God through our works (Titus 3:5-7). Our works, our performance, our faithfulness, our behavior, has nothing to do with it. The only thing I contributed toward my salvation was the need for it (Romans 3:23). My works, my righteous deeds, are filthy rags and earn me death (Isaiah 64:6, Romans 6:23). This is what I deserve. What I don’t deserve is to be saved despite my unrighteous works (Ephesians 2:1-9). In fact, the bible says that God justifies, or declares righteous, those who do not work (Romans 4:4-6). The bible mentions two kinds of righteousness in Romans chapter 10, God’s righteousness and our own. Verse three says that if we are seeking to establish our own righteousness, then we are not subjecting ourselves to the righteousness of God. We will either stand before God attempting to establish our own righteousness, (filthy rags, Isaiah 64:6) or we will subject ourselves to the righteousness of God. In other words, we need to repent of our righteousness and accept the righteousness of God provided for us through Jesus! Second Corinthians 5:21 explains that Jesus took on our sin, “so that, we might become the righteousness of God in Him.” Our righteousness is insufficient. God will reject it outright. It is only the work of Jesus Christ on my behalf that God accepts. To believe otherwise is to trample under foot the Son of God, consider His blood unclean, and insult the Spirit of grace (Hebrews 10:29). Mormonism works (pun intended), the opposite way. The only test for faith that prospective Mormons are encouraged to pursue is found in Moroni 10:3-5. Investigators are told to “ask, ponder and pray” and if they do so with real intent, then God will reveal the truth of Mormonism to them by the Holy Ghost. I have had many Mormons testify to me that they have received a spiritual witness, described as a beautiful feeling, that Mormonism is true. Investigators of Mormonism are not encouraged to test Mormonism by other means. History, archaeology, textual criticism of the Book of Mormon, prophecy, Joseph Smith’s polygamy or criminal activities, none of it matters when compared to the inward, subjective testimony of what is believed to be the Holy Ghost. Not even the bible. I had one Mormon lady tell me that I could hand her a “stack of facts” proving that Mormonism was false, but she would still believe Mormonism because of her spiritual witness. Note that she did not say, stack of evidence. She said stack of facts. Speaking from more than 25 years’ experience of talking with Mormons, this is not an uncommon sentiment. There is no work, in the sense of study or research, that Mormons are encouraged to pursue for the purpose of strengthening their faith like they are encouraged to pray. Granted, some Mormons do study and research, but what they learn through these disciplines is always subject to how it makes them feel. Their study is subjected to their feelings instead of having their feelings subjected to their study. Ironically, Mormons believe hard to believe, as opposed to work hard to believe. The book of Mormon redefines faith as incomplete knowledge. Alma 32:21 says, “And now as I said concerning faith—faith is not to have a perfect knowledge of things; therefore if ye have faith ye hope for things which are not seen, which are true.” In other words, you need to believe something is true without any proof, otherwise, what you believe isn’t done so with faith. Verse 27 of the same chapter explains. “But behold, if ye will awake and arouse your faculties, even to an experiment upon my words, and exercise a particle of faith, yea, even if ye can no more than desire to believe, let this desire work in you, even until ye believe in a manner that ye can give place for a portion of my words.” Before you can believe Mormonism is true, you have to desire to believe that Mormonism is true. If you follow this prescribed manner of “belief,” then you will come to “know” that Mormonism is true. Contrary to the Biblical gospel message, Mormons believe their personal works contribute towards their being forgiven. This is one of the many things they “know” is true about Mormonism. In Mormonism, being reconciled to God is not done as a gift, it is done based on their works. Many Mormons would disagree with that last sentence, but the testimony of Mormon leaders is clear. “The gospel of Jesus Christ is the power of God unto salvation, and it is absolutely necessary for every man and woman in the Church of Christ to work righteousness, to observe the laws of God, and keep the commandments that he has given, in order that they may avail themselves of the power of God unto salvation in this life” (Teachings Of Presidents Of The Church, Joseph F. Smith, p. 243). “The Lord will bless us to the degree to which we keep His commandments. Nephi … said: ‘For we labor diligently to write, to persuade our children, and also our brethren, to believe in Christ, and to be reconciled to God; for we know that it is by grace that we are saved, after all we can do. (2 Nephi 25:23.) The Savior’s blood, His atonement, will save us, but only after we have done all we can to save ourselves by keeping His commandments” (Teachings of The Presidents of The Church, Harold B. Lee, p.24). Notice the constant theme. Mormons are told they must keep commandments, do all they can do, and that they are saved by their obedience. Mormons work hard because of what they believe. Here is the contrast. Christians work for what we believe, but what we believe cannot be worked for. We work for our faith (belief system), then believe it. Mormons believe their faith (belief system), then work for it. The difference is, Christians are told to test their beliefs to see if it is true, whereas Mormons are taught to believe it and then they will know it is true. This does not line up with what Jesus did in the first chapter of Acts for those who doubted in His resurrection. He did not tell them to pray and believe. 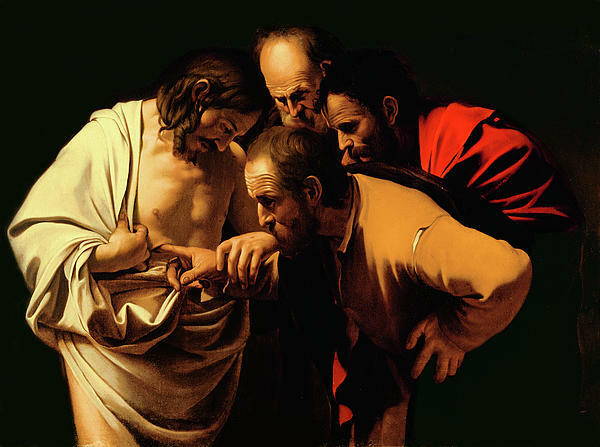 Verse three states, “To these He also presented Himself alive after His suffering, by many convincing proofs, appearing to them over a period of forty days and speaking of the things concerning the kingdom of God.” Christian faith is an objective faith, there are reasons for it and there is proof. If you don’t study, test and question, but just believe, your faith is dead. It isn’t living and active. It is lifeless and rote. Keith Walker is the President of Evidence Ministries. He was born in Michigan City, Indiana in 1967, born again in Rochester, New York in 1988 and has lived in San Antonio, Texas since 1992. Keith has a twisted sense of humor, a strong sense of justice and an unusual way of looking at things. His favorite book of the Bible is Romans, favorite color is tye-dye, and likes to compete in USPSA sanctioned handgun matches at the Bullethole Shooting Range. At present, he is a “C” class Production shooter. Keith’s personal goals are to raise a God-fearing family, mentor his children to be noticeably different Christians, read the Bible through once every year, increase his handgun proficiency and read one book a month. His spiritual goals are to live a life that will count for something and impact others long after God calls him home. Keith’s gravestone will read: Keith Walker, Born: 9/24/1967, Born Again 9/16/1988, Died: Date, When Jesus comes, I’ll be back. Elder Jeffery R. Holland speaking at the October 2017 General Conference. During last Fall’s General Conference, I had two Latter-day Saints recommend that I listen to the talk given by Elder Jeffrey R. Holland, an apostle of the Mormon faith. The talk, entitled “Be Ye Therefore Perfect- Eventually” was rumored to put the nail in the coffin of the argument levied against the church that it holds to an impossible gospel. Holland begins his speech by ripping Matthew 5:48 out of context, saying we are to be “…perfect, even as your Father in heaven is perfect,” and continues, “yet surely the Lord would never give us a commandment He knew we could not keep.” His main idea throughout the talk is that we can be content with steady improvement. The ironic part is even in the out of context version embraced by the LDS church, Jesus did not say to be perfect- eventually. He simply said to be perfect – that is, right here, right now. The talk’s title, which I was not aware of until recently, called to mind Alma 13:27 which says, “And now, my brethren, I wish from the inmost part of my heart, yea, with great anxiety even unto pain, that ye would hearken unto my words, and cast off your sins, and not procrastinate the day of your repentance.” Alma did not suggest shaving off our sins, little by little. I would argue (and I think Alma would agree) that steady improvement is just a fancy word for procrastination. Now lest any of you get the wrong idea and think I do not like Elder Holland, let me set the record straight. He is far and away my favorite LDS apostle. As far as public speakers go, he is probably the most powerful man in the entire church. And if he showed up at my door on a stormy night, looking for food and shelter, he would have it. No questions asked. This final quote hits the nail on the head and is the hope of all Christians everywhere. And while I do appreciate his humility in admitting he needs mercy and is sometimes an enemy of God who despitefully uses Him, it makes me wonder how any Latter-day Saint can expect to eventually gain perfection. Because if Elder Holland, an apostle, has not obtained it at the age of 77, then seriously, who can? Things take a particularly precarious turn when Jeffrey R. Holland attempts to explain the parable of the Unmerciful Servant. In the parable, a man is forgiven a 10,000 talent debt, only to harshly punish a debtor who owes him a mere 100 pence. It’s a pointed story about the importance of forgiveness. Holland, however, puts an unusual twist on the meaning of the parable, rendering it not only unbiblical but contrary to The Book of Mormon as well. First, he compares the debts to what they might be in modern U.S. currency. The debt the man was forgiven would be roughly equivalent to 1 billion dollars, while the amount he refused to forgive would be 100 dollars. The implication is that we are capable of making a down payment of 100 pence to God and go from there to eventually come to pay the remaining 10,000 talents. “For behold, are we not all beggars? Do we not all depend upon the same Being, even God, for all the substance which we have, for both food and raiment, and for gold, and for silver, and for all the riches which we have of every kind? 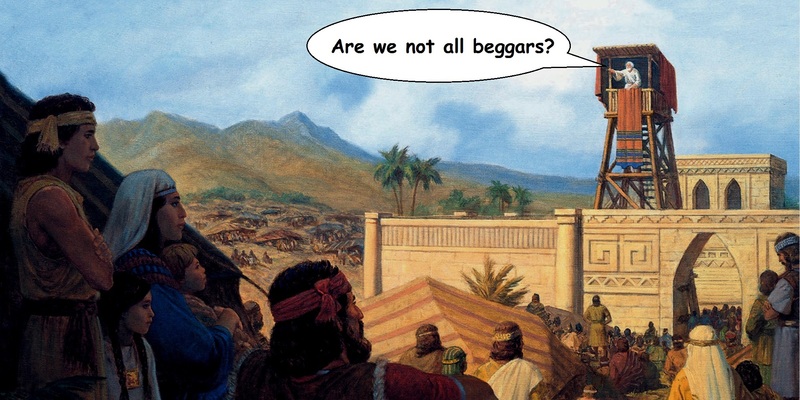 According to King Benjamin, we are all beggars. And do beggars have the ability to pay 100 pence? No, we do not. Even the servant in the parable used by Jeffrey R. Holland could not pay the 100 pence. What Latter-day Saints are being asked to do essentially, is to be able to leap out of earth’s atmosphere by the end of their lives. But not to worry, a six foot vertical will suffice for now, as it is clearly within our ability to do. The fact remains that for we fallen, broken, and sin-corrupted children of Adam, perfection is indeed an impossible gospel. Whether it is now, or 50 years down the road, not one of us is up to the challenge – no, not one. We are all beggars. Perfection has to be granted as a gift – it must be imputed to us. How grateful I am that at least Jesus is impossibly strong and perfect and that He has given me that perfection as a gift. Because if I were trying to obtain it through my own merits, all the time since the creation would not be near enough. Yes, we are all beggars, but Jesus’ gift of imputed perfection is enough. It is finished. King Benjamin’s response to Jeffrey R. Holland. I was born and raised in the Mormon Church, and in early 2015 I began a serious study on the topic of grace. One of the first videos I watched was a BYU devotional given by Brad Wilcox called “His Grace is Sufficient”. Not only did Mr. Wilcox revolutionize the way I viewed grace, his talk was largely responsible for my journey out of Mormonism and into mainstream Christianity. This is a common misconception about Evangelical Christianity. Having been LDS, I recall thinking the Christian model of salvation was very 2-dimensional. Having passed through the veil so to speak, to the other side, I see now that Christianity is not what Brad portrays it to be. In fact, as an Evangelical, my day to day lifestyle is not so different from how I lived as a Mormon. What has changed is my motivation for living the way I do: before, I was trying to earn heaven, and now I’m learning it. I was obeying from a place of condemnation, but now it’s from a place of acceptance. Before it was about fear, now it’s about appreciation. When I embraced Brad Wilcox’s grace, I found that I fit in with Evangelicals much more than my fellow Latter-day Saints. So in answer to his unconsidered question, here is my unexpected answer: yes, the grace of Christ is changing me. As a Latter-day Saint, I scoffed at the idea that we were created for God’s glory alone. As I mentioned previously, it seemed 2-dimensional. I thought those who were “saved” would have no motivation to be better spouses, parents, employees, and disciples. I assumed as Brad stated, that Christians believed “God required nothing of [them]”. Nothing could be further from the truth. In reality, God’s abundant grace motivates Christians to improve and give their lives to Jesus. He goes on to explain that Latter-day Saints can sometimes view God’s commandments as overbearing and say, “Gosh, none of the other Christians have to tithe. Gosh, none of the other Christians have to go on missions…” Actually, we do. To set the record straight, “other Christians” do understand the importance of obedience. I was shocked the first time tithing was discussed at my Protestant church. I thought I had gotten away from all that! My pastor explained that we don’t pay tithing to get into heaven, but because we’re free. As a Latter-day Saint, my perception was that Christians viewed grace as a license to sin. I see now that grace is better described as insurance, covering us in case we sin. In his speech, Brad Wilcox mentions several people who don’t understand grace: there are those who are giving up on the LDS church because they are tired of falling short, young men and women who graduate from high school and slip up time and again and think it’s over, return missionaries who slip back into bad habits and break temple covenants and give up on hope, and married couples who go through divorce. He chides anyone who thinks there are only two options: perfection, or giving up. He does not seem concerned that such a huge swath of Latter-day Saints are ignorant about grace, even after admitting he used to picture himself begging to be let into heaven after falling short by two points. My idea of grace was not dissimilar to his. Ironically, he belittles Christians for having the same view of grace he has now, while turning a blind eye to Latter-day Saints who hold an opposing view, as if it were a coincidence. However, these views against grace are not a coincidence, but a byproduct. My diagnosis is that Brad Wilcox understands grace, but he doesn’t understand Mormonism. After all, Alma 5:28-29 in The Book of Mormon says if we are not stripped of pride and envy we are not prepared to meet God, nor do we have eternal life. 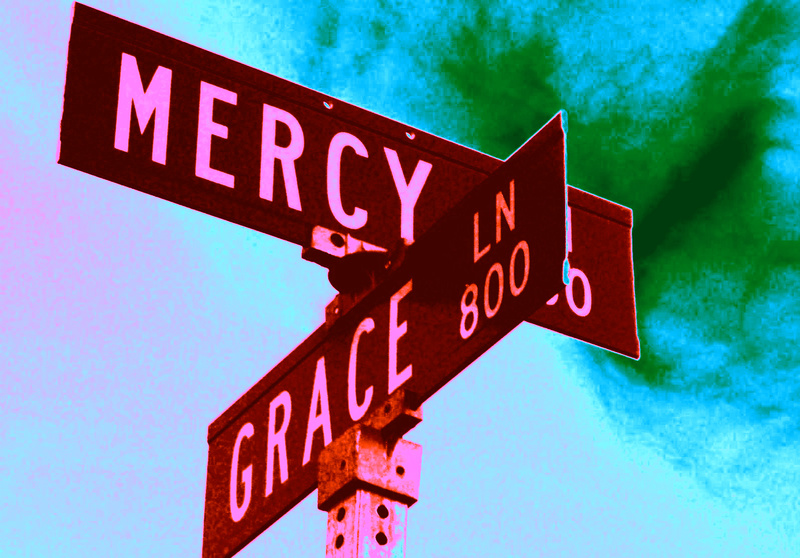 Where’s the grace in that? Doctrine and Covenants 82:7 says if we sin our former sins return to us. Where’s the grace in that? Moroni 8:14 states that should someone die while thinking children need baptism, his destination is hell. Where’s the grace in that? Alma 11:37 says that Jesus cannot save us in our sins. My friends, there is no grace in a religion that says we must amputate all sin from our lives before Jesus can save us. Mr. Wilcox conveniently leaves out covenants in his speech, which form the foundation of eternal life in Mormonism. According to LDS doctrine, covenants like baptism and temple sealings are required to enter the Celestial Kingdom. These covenants are two-way promises where God gives us eternal life if we keep our end of the bargain. The temple covenants include keeping the commandments, so a Latter-day Saint who fails by 2 points on judgment day will have no right to plead for grace. In Mormonism, grace is not enough. I do love Brad Wilcox’s speech. I would not be where I am today without it. That said, I call upon him to repent for his false witness against Evangelical Christians and I pray he will see the error in defending an organization that tramples the grace of God. I can say from experience that coming into Protestant Christianity from Mormonism is like “…paying a mortgage instead of rent, making deposits in a savings account instead of paying off debt…”, it’s the difference between being a servant of your own free will, and being a slave. Michael Flournoy served a two-year mission for the LDS Church where he helped organize three Mormon/Evangelical dialogues and has participated in debate at the Southwestern Baptist Theological Seminary. Born into Mormonism, Mr. Flournoy converted to Evangelical Christianity in 2016.